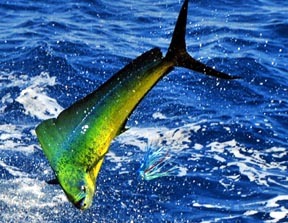 WHAT: Mahi-mahi are probably the most colorful fish found while trolling the open oceans. Scientifically named Coryphaena hippurus, they go by many other names like, Dolphin, Dorado, or Goldmakrele. They also have other nicknames based on their size…Chicken, Peanut, Bailer, Gaffer, Hoister, Cow, Bull. The name Mahi-mahi is Hawaiian for “strong-strong”. No Matter what you call them, they are not only one of the best tasting fish in the ocean, but can be one of the most dogged fighters swimming in the tropical waters. Dolphin are easily distinguished for both its coloring and its shape. Dolphin have long, compressed bodies with a large forked tail and a dorsal fin that extends nearly the entire length of its body. Males have a tall blunt head, while females, and both sexes of the smaller species of Dolphin, the Pompano Dolphin, Coryphaena equisetis, have a rounded head. Colors are bright and brilliant ranging from yellows, greens, to blues. Their underbellies are usually lighter in color, while the backs are darker green to shades of deep blue. They can be spattered with dots of blue and green. While free swimming, they are more subdued, but once excited, they become electric and each fish seems to be different. Fish have been witnessed being nearly all blue or even white with blue spots. Mahi feed aggressively from birth and grow extremely fast. They can weigh near 3-5 pounds within a span of 6 months and within a year can reach lengths of 3 feet and top 20 pounds on the scales. Some can reach 4-5 years of age and weigh over 50 pounds, but many don’t live longer than a year or two since they are a target of fisherman and larger pelagics like Billfish. The current World Record Mahi is 87 pounds and was caught in Costa Rica in 1976. The young feed primarily on crustaceans and larvae of other pelagic fish while larger, more mature fish, feed on flying fish, mackerel, triggerfish, and just about anything else floating around sargassum beds. Studies show that Mahi feed primarily during the day, but have been know to feast at night when the moon provides the needed light to see its prey. Breeding can begin very early when fish are as small as 8 inches. Mahi reproduce often, sustaining this great fishery. Mahi roam the open tropical and temperate oceans (waters 68-86 degrees) in search of food. Smaller fish tend to school together and can be found around any piece of floating debris or along sargassum beds. Larger fish become lone rangers or can be found in male-female pairs. They are extremely fast swimmers and can cover vast areas searching for food. Some scientists believe Mahi can reach speeds of 50 mph in short bursts. Anglers target these fish not just for their delicious meat, but also for their fighting ability. Mahi, once hooked, are magnificent fighters. The name Mahi-mahi comes from Hawaii meaning “Strong-strong”. Tailwalking and superb aerial shows can ensue. Fish are know to scream line off a reel in one direction, only to do an about-face and take the fight in the other direction. They can also use their broad bodies and tall dorsal fins to their advantage and dig in for a tug-of-war. They don’t stop fighting once in the boat, either. They’re know for flopping around a pit, so proceed with caution when boating these breathtaking fish. WHEN & WHERE: Dolphin roam all tropical and sub-tropical waters over the Globe. Waters ranging in temperature from the upper 60’s to mid 80’s are prime spots for Mahi. Most Mahi are caught as a by-catch if you will while anglers are trolling for other species like Tuna or Marlin. 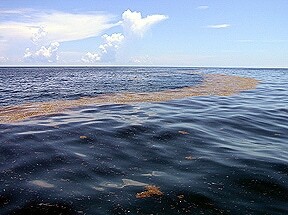 For those wanting to target them, finding any type of floating debris or sargassum is key. Large weed patches and flotsam can be home to small baitfish. They congregate around these areas for protection. And where there’s bait, the predators are soon to follow. Smaller Dolphin will school under these weeds and debris in ambush of these smaller baits, and as protection from their own predators. Larger Bulls and Cows are known to hang on the outskirts of large weed beds. With their tremendous bursts of speed, they are able to strike from a distance in a hurry. Locally along the Mid-Atlantic, Mahi can be caught as close as Navy towers off the Outer Banks and the Triangle Wrecks out of Virginia, all depending on water temperatures. Mahi landings start in Hatteras and Oregon Inlet in mid to late April and will continue through the Summer. Once waters warm up over the Cigar and Norfolk Canyons, Dolphin will appear on the docks of Virginia marinas. HOW: Trolling, jigging, casting, and chunking are all great ways to catch Mahi. Once you find them, they will accept nearly any bait offered to them. I’ll cover the basics of trolling along with some techniques for bailing Dolphin in this How-To. Trolling is the best way to locate these fish. Like I said earlier, most Mahi are caught while in pursuit of other game fish, like Tuna and Marlin. When you come across a weed patch or debris field, spreads can be adjusted to entice more large Mahi strikes. As with other offshore game fish, you’ll be trolling a spread of rigged ballyhoo and lures. A typical spread I run for Mahi consist of seven lines. I like to have medium size Ballyhoo in the cooler with a couple of Horse Ballyhoo to weed out the smaller Dolphin. Lures selection will contain Shooters, a couple of sea witches, a few larger chugger style lures, a couple of daisy chains, a Mini Bar or two, and of course a Boone bird. My color choice will be on the bright side, greens and yellows, pinks, and blue and white. Down the center in the Shotgun position will be a Boone Bird with a Horse ballyhoo rigged behind a chugger style lure, like a Get Reel Lure T.C.B., or a bullet shaped lure like a G&H Islander. Off the Long Riggers, I’ll set rigged medium ballyhoo behind seawitches or Shooters. The Short Riggers will be either Mini Bars or Conga Line Daisy Chains, again with trailing rigged medium ballyhoo. The Flat lines will see a smoking chugger lure on one side and another skipping medium ballyhoo behind a witch or Shooter. Cedar plugs, Boone Marauders, or even naked ballyhoo can be substituted on the Flats. Larger lures can also be run off the riggers. The larger baits will sift through the smaller bailer Dolphin and bring in the larger trophy fish. Mahi aren’t picky eaters. Their voracious eating habits get the better of them. Once you hook a Mahi, be prepared for a nice fight, especially if you’re using lighter tackle. Mahi around 15 to 20 pounds and smaller will travel in schools of approximately the same size fish. If you hook one, there are bound to be others around. This is when bailing comes into play. A bailing rig can be as simple as a hook tied to a length of leader and attached to your mainline, either by knot or snap swivel. If using lighter leader, a snap swivel is best as Mahi do have small teeth and will chaff a leader quickly. With a school of fish behind the boat at this time, speedy changes are key. Circle hooks are great as they improve hook-ups as well are better for the fish if you plan on releasing what you can’t eat. Tie your 4/0-7/0 hook to your leader, about 3-4 feet of 30-60 pound mono or fluorocarbon, and attach to your main line. You can use a Spider Hitch to make a loop in the other end of your rig to attach to the main line via a snap swivel. Size of hook and leader depend on the size of fish behind your boat. It good to have several rigs made up in advance in varying sizes. Storing these can be made easier by using a kids pool toy. Take a section of those foam noodles kids use to float around in the pool. Lay the looped end on the noodle and then wrap the hook around and then push the hook point into the foam. Nicely stored and ready for action. Cut bait, like ballyhoo, shrimp, and squid are good baits, but cut False Albacore will drive them nuts. Cut bait into chunks and broadcast a handful out. Don’t feed the fish; just get them into a frenzy. Bait your hook with the same bait and drift it back with the chunks. The Mahi will come running as if you rang a dinner bell. This is also a great technique to draw fish out from under a weed patch. We often have a few spinning rods rigged with bucktails ready to go as well. Another great lure is a top water plug. Seeing a Mahi crash a bait and feel the hit is intense. To help keep the fish around the boat, leave a hooked fish in the water until another gets hooked. The rest of the school gets excited by the stimulus of one of their buddies being lit up. This goes back to their eating habits. They see one fish eating and the competition is on for them to get their own meal, causing the frenzied feeding we want behind our boats. Sometimes if the school has been worked by previous boats, getting bites can be difficult. This is where having different kinds of bait to offer will come into play. There are currently no size limits on Mahi in VA and NC, only bag limits of 10 per person per day, not to exceed 60 per boat per day. Some states do have length limits, like Florida for example, which is 20” curved fork length. Try to remember that someone has to clean all those fish when you get back home. Keep what you can eat and let the others swim another day. Most of those little fish will be over 20 pounds in less than 6 months, almost a paper in Virginia.